This is a generic or standard controller for any type of process. 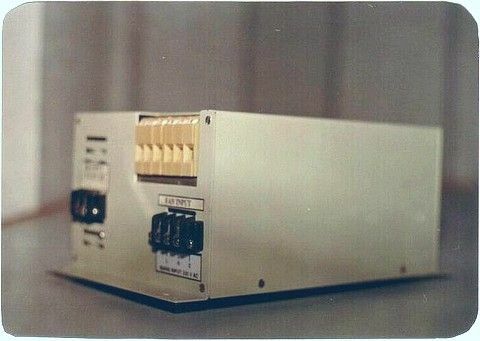 Shown here is a temperature controller. 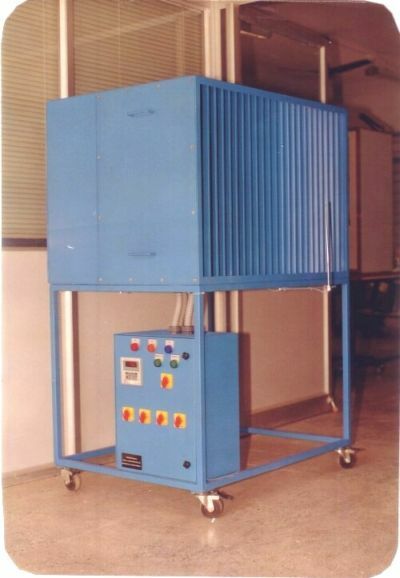 The STC1000 could be used for Ovens or furnaces, liquid baths, heating or environment chambers. It has a single analog input and an analog or relay output. Analog inputs could be like 4-20 mA, thermocouple or RTD. Analog outputs can be 0-10 V for a thyristor drive, SSR drive output or potential free contacts of a relay to operate external 3 phase contacters. The closed loop control could be On-Off or Time-Proportional. 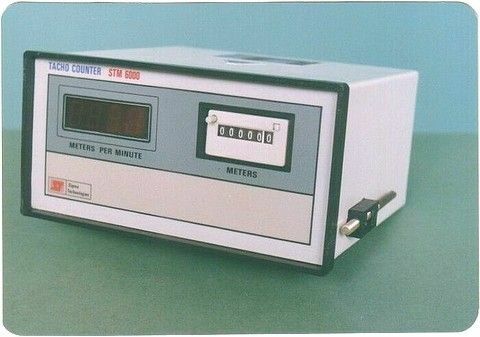 It was known as digital temperature indicating controller. Sometimes it would be used just as a Alarm or in a Trip circuit for protecting a system, when a uP or uC based PID controller fails. This is used in the processing of plastics, rubber, metals and in chemical plants too. Here is a checklist that was made for helping its fabrication. You can see the limitations in which we manufactured these products. An optimum quality was evolved, defined by a user's affordability of the product. Has Transformer been soldered properly with reinforced pads - Scrape with blade area around pad and make lead bridges to support transformer.Front Card and Rear Card must have very thick solder bridges after fixing sq. post. Is the Front and back stickers and SL. No Sticker properly stuck - In Front Sticker the holes for switch, pot LED etc. must be without Burrs file and improve. Acrylic should not have cynoacralate stains. In the back sticker there should not be any wrinkles use rubber solution (fevibond) to stick properly. Are all the Threaded parts and Plastic parts fixed with fevibond - Use Fevibond (very little) for the CJ box in rear panel all Metal screws and loose mechanical parts in Pots, plastic threads and pillars. This prevents parts from breaking loose during transportation or vibrations, All Nuts / Bolts fix tightly . Are all the Pots. Turning freely and is direction proper - Clockwise is always increment or increase in a parameter and anti-clockwise is decrement of any control or parameter. All pots should turn without friction. Are all the Front panel components Fixed properly - All Four Displays are required Fourth is for Overrange and Polarity. LED's are for Load On or Process on and Should be neatly visible above sticker and Switch should not get stuck after cabinet is closed and screwed. Only two screws must be visible on the back panel - Cover Pot clamp screw, card fixing screw etc. by Black insulation tape.Use Ni. plated Phillips / Universal head Screws for fixing back plate. Are all other items in the final packing - Check by fixing both side clamps and file if required add Instruction manual in Cover or with Invoice and DC. Sources of omissions and neglect checked by Visual Inspection - Gnd to Earth Capacitor to be added 0.01uF 103 1kV, Relay OEN only, Polarity of Electrolytic and diodes , Regulator tab touching any conductor, Loose wire strands, Solder Bridges absent at places where it is required. Troubleshooting when a card does not work - Keep always a 3D reference of a working unit / card compare component to component by visual inspection wrong polarity of diodes / Tx / IC, wrong value of Resistor or Low value capacitors missing jumpers solder bridges or hairline shorts at edge of board or pad to pad lead streaks. This is a Thyristor Based Normally Open 230V Switch that can be turned on / off at a fast rate. This switches at Zero Crossover .Built In Snubber reduces EMI and protects the SSR. USE SAME PHASE FOR I/P & O/P. The Termination's of High Current Lines going to Load must be very tight and crimped. Loose contacts will Spark and cause Fire. Fuse Rating of HRC Fuse - High Rupture Capacity (HRC) Fuse is Safe and Reliable. 5kW Heater at 230V is 5,000 / 230 in Amps of Fuse Rating. Temperature Control in Plastic Injection Molding. Terms in Process Control and Explanation. 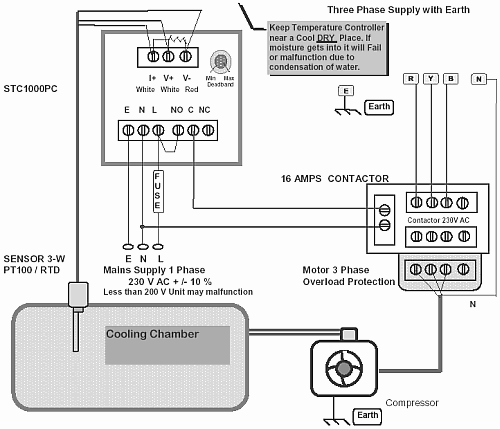 There are three Controls to be Adjusted to make a Proportional temperature Controller Perform Properly. This method has to be practiced and experience gained from it can be used to get very good and stable Control of the temperature or other process parameters. This is the Temperature at which you require the Heated area to be. Here we have to remember it is better to control the temperature of the metallic area closest to heater to avoid thermal Cushions. In Rubber and Plastic Molding if you are measuring the plastic temperature directly it may give rise to oscillations and proper control may not be possible. In Controlling the Temperature of Air or Water (Bad Conductors of Heat) Forced Convection with Fans for Air or Stirrers for Liquids can be used when Sensing temperature of the Liquid or air directly. But in Plastic such things cant be done as it is a semi-solid when heated hence. Control of Temperature of the Metal Discharging Heat to the Plastic is most practical. Oscillations are inevitable if the sensor is away from heater or is in contact with a non-conductor of heat. This is the Temperature at the Tip of the sensor or the material touching the tip of the sensor. In Non-Conductors of Heat like plastic if we are monitoring plastic at a certain point the temperature of the plastic will be very different at various points depending on the Distance of the Heater from that point due to thermal gradients. Dead band or H % or Hysteresis are terms used in on / off Controllers in proportional controller we use the term proportional band. The Temperature zone in which the Controller turns on or off The heaters in a time proportional manner is the proportional Band. Set Point 200 deg C It is Given in % e.g. 10% PB of 200 deg SP is 20 deg. the Heaters are on till 190 deg C and off above 210 deg. C. Between 190 to 210 is the PB. A little above 190 the Heaters are on for 90% time. A little below 210 Deg C the Heaters are on for 10% of the time. When SP=PV Process Value the Heaters are on for 50% of the time i.e. 50% Duty Cycle. This is the repetitive rate at which the heaters are Turned on or off Room Temperature 26 deg C For a Cycle time of 12 Seconds, when PV=SP heaters are on for 5 seconds and off for 5 seconds and this goes on as long as PV=SP. 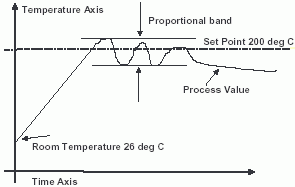 Tuning or Adjusting a Proportional Temperature Controller. Ensure Sensor is properly connected to the Temperature Controller TC polarity reversal will show reducing reading in the Display as heat builds up. The Heaters used and wattage selected must be able to bring the temperature more than the maximum required control temperature with TC. 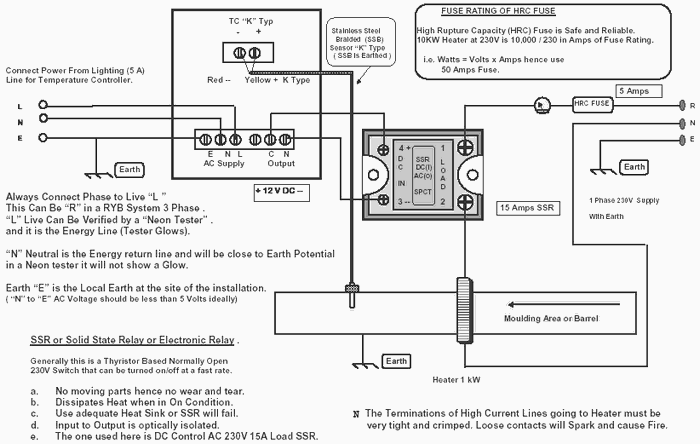 If Supply Voltage is down or heaters are blown or not in contact TC can not solve the problem. So when in doubt connect heaters directly to supply (without TC) and see observe maximum temperature e. g. if max. temp. is 500 deg C the TC can control temperature upto 480 deg C.
Keep PB in minimum position and power on system e. g. set temperature is 300 deg C. Now Observe maximum overshoot. and adjust proportional band as in table below. 10 % 330 deg C or more Near Maximum fully clockwise till end. 5 % 315 deg C to 360 deg C Middle of the PB Control or towards max. 2% 306 deg C Little above present setting. Less than 300 deg Droop e. g. 290 PB is Critically set Do not Change. After each change turn on system again to see response till 2 % or less variation or overshoot or oscillations are obtained. Increment PB to Decrease Overshoot. Increment PB to Decrease Oscillations. Adjust EC to match SP = PV after PV is stable at a point less than SP. There is an additional control called Error Cal EC ( manual reset or Integral) which is factory set for SP=PV 50% duty cycle. In certain cases after stable reading is obtained after adjusting or tuning PB the temperature may stabilize say at 290 deg for a set point of 300 deg the process is stable but a ten degrees process error is present. this can be compensated in two ways. a. Increase setpoint to 310 deg the process settles at 300 deg but this may not satisfactory even if it is practical. b. Adjust Error Cal provided in the back panel to increase temperature to 300 deg from 290 deg. When this is done give some time for system to respond after every 1/2 a turn 180 deg of the control. the EC control is a Ten turn potentiometer like the SP potentiometer after 10 turns the direction of turning must change. Clockwise Increase temperature Anticlockwise decrease temperature. (at min. PB setting EC pot sets the On/Off Operating Point). 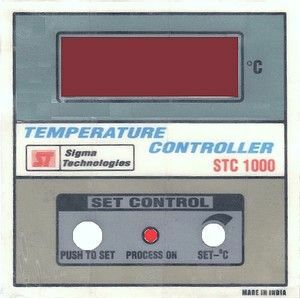 Temperature Control using SSR and STC1000PK. Generally this is a Thyristor Based Normally Open 230V Switch that can be turned on/off at a fast rate. Use adequate Heat Sink or SSR will fail. Input to Output is optically isolated. very tight and crimped. The one used here is DC Control AC 230V 15A Load SSR. Connect Power From Lighting (5 A) for Controller. C Common is connected to NC when Relay is off. NO Normally Open is Disconnected when Relay off. (connected to C when Relay on). NC Normally Closed is Connected to C when Relay off. (disconnected when relay on). 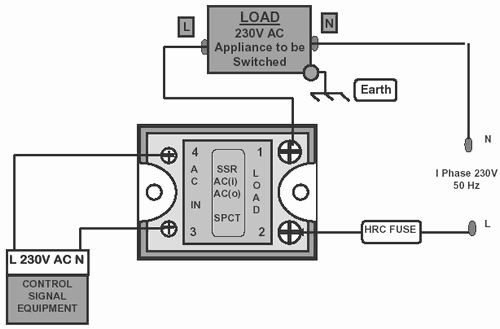 Relay outputs are Potential Free or Floating or at High Impedance. 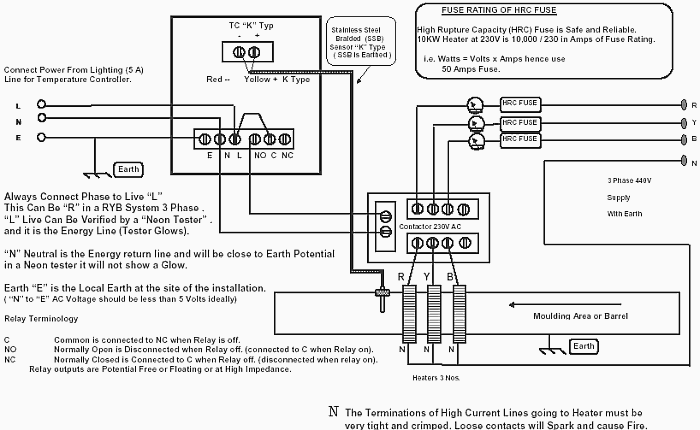 Note - The Terminations of High Current Lines going to Heater must be very tight and crimped. Loose contacts will Spark and cause Fire. 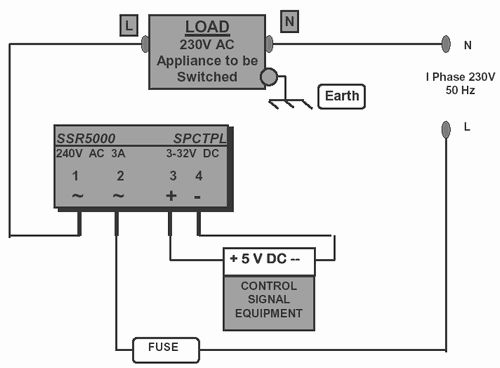 Diagram of SSR 5000 DC 3-30 Control / 230V AC N.O. @ 3A. This is a Thyristor Based Normally Open 230V Switch that can be turned on / off at a fast rate. This switches at Zero Crossover . Use 5V DC for Best Results. Dissipates Heat when in On Condition 5 Watts @ 3 Amps. Mount with adequate Air Ventilation for 3 Amps. Dissipation is 1.4 Watts per Amp thru Load. Input to Output is optically isolated 1kV. This one is DC 3-30 Control AC 230V N.O. Output. Off state snubber Leakage is around 1 mA. Fast Blow Fuse is to be used. Use a 2 Amps Fuse with Holder in the Hot Line. It was to monitor the Alertness of the Security Guard. Periodically the Unit will Buzz and Flash and the Security Guard has to press a Big Button to indicate he is awake, alert, agile and around the Unit. These are basic measuring circuits you can build for your home lab. I have documented a lab DMM i had built for my use many years ago. the circuits may have errors, build it only if you understand. Auto ranging 4-1/2 digit digital voltmeter using ICL7135 of Intersil. Example - In a Oven, one batch may have 100 metal boxes to heat, the second batch may have 10 boxes, the door may be frequently opened and the mains power (heater) may be fluctuating. A system that is able to adapt to these changes, without much readjustments is the objective of an ideal process control. The Accuracy and the Energy efficiency being the most important. Pneumatic or Steam Valve, Solenoids-Motors. When Mounted at the end of the PCB it offers over 2kV Isolation from the Digital Circuits. The Output 230V signals NO-NC, can control Light Loads like the Coil of a Big 230V Relay also called contactor. It could be Mounted on a PCB by soldering or a Plugin Base. 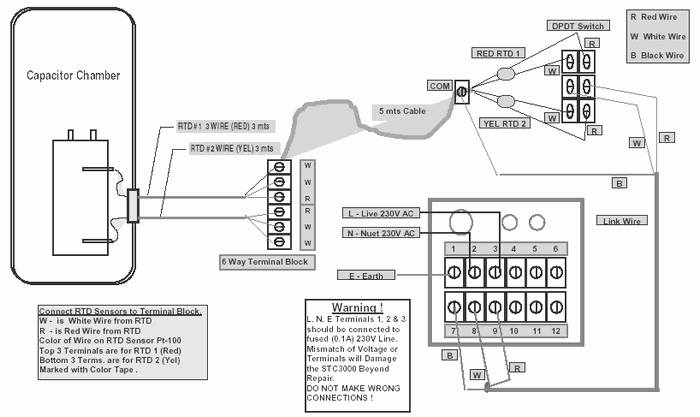 It is better to have Crimped connections or Terminals. 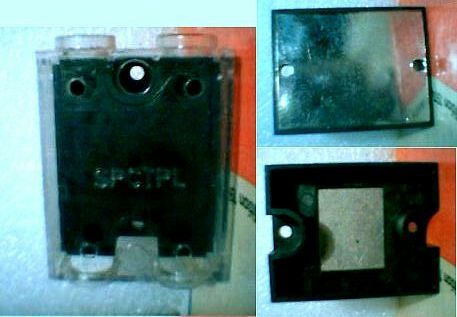 A very good quality spring Loaded Socket may also work but it has to be rated for many operations. Things like Nickle Alloy Plated, Beryllium Copper were the Materials Jargon. A contact resistance in the Terminals, a mismatch of alloys, electrochemical reactions, Corrosive Fumes, Brine or High Humidity can build a Loose connection into a Dangerous Sparking Contact. Not only the Functionality of the SSR will be affected in a Sparking Contact, but a Risk of a Fire Developing. When Inflammable Materials or Volatile Liquids are Present Nearby, the risk is even greater. 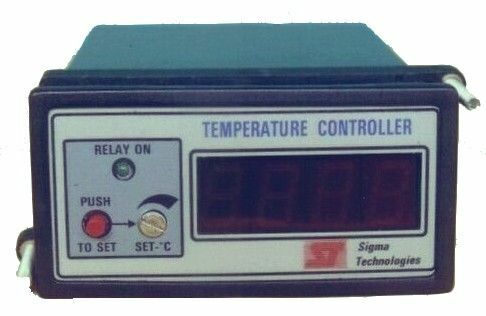 A 1/8 DIN Indicating Temperature Controller. This is a Analog Controller built around ICL7107. Read more here Temperature Measurement and Control. This is a 20 Tera Ohm Insulation Tester I made around 20 Years Back. It had even Polarization Index for Transformer Insulation. It generated 1000V DC Regulated Voltage and the pA leakage Current was Measured. See more here Insulation tester or Tera ohm meter. A regulated, low ripple, high voltage of very low current capability is applied by instrument on a DUT (device under test). The leakage current in nA or pA (picoamps, nanoamps) is measured and readout, The Innovation i did was to measure the current in Vref and not Vin of ICL7107, this made the 1/x computation. Also using the ICL7650 Chopper Stabilized amplifier must be done as shown in data sheets with grounded guard rings. pA will leak on the PCB itself if layout is not done keeping this in mind. Here is a collection of web pages of VU Meter projects that helps a newbie getting into the Electronics DIY Hobby Land. A Hobby now in your School days or College can help you build a strong profession later. It is Edutainment that will make productive use of your spare time. Friends can do it as a group, during holidays. Parents should encourage healthy hobbies, as the children will grow in a positive and creative atmosphere. This is a very eye appealing audio accessory. Displays an approximate output level for each channel of a stereo amplifier. Connects to the speaker terminal; levels are displayed in ten steps. User may select either a moving dot bar appearance. Uses two LM3915 IC's; includes a discussion of measuring audio power. This section of the Scots Guide deals with Analogue Electronics with a special emphasis on Audio-related topics. There are also some specialist pages on the properties of cables as these relate to audio. The First Eleven - Basic electronics courses sometimes make it appear as if electronic engineers have an obsession with voltmeters, batteries, and oscilloscopes. That's because it's often convenient to talk about these when presenting a course at a university, college, or wherever. In reality, the physics and electronics of practical systems like Hi-Fi's, TV's, computers, etc, are much more interesting. The main components used in electronics are of two general types: passive (e.g. resistors and capacitors) and active (e.g. transistors and integrated circuits). The main difference between active and passive components is that active ones require to be powered in some way to make them work. Active components can also be used to amplify signals. by J. C. G. Lesurf University of St Andrews Astronomy Group, Scotland. This category contains a number of subcategories, books, and pages related to Electrical engineering. Books can be found on the Engineering EE. Courses can be found at Wikiversity:School of Engineering. Subcategories include specific engineering disciplines, including Electrical Engineering, Computer Engineering, Mechanical Engineering, and Civil Engineering. Also, some books that are general to all disciplines are listed here. Analog and Digital Conversion, Automatic Control Engineering, Automotive Systems. Basic Electrical Generation, Basic Electricity, Biography of Nikola Tesla. A website for anyone wishing to learn about electronics or build simple projects. Written for beginners but used by many others as a quick reference. Example Projects, Construction of Projects, Soldering Guide, Study Electronics, Electronic Components, 555 Timer and Circuit Symbols. If you are new to electronics and would like to try adapting published projects, or designing and building your own circuits, you need to have a small stock of components available. Thomas Alva Edison also known as "The Wizard of Menlo Park" was an American inventor and businessman, He is known for inventions like phonograph or gramophone, the motion picture camera and the electric light bulb. The Thomas A. Edison Papers - The Thomas A. Edison Papers Project, a research center at Rutgers School of Arts and Sciences, is one of the most ambitious editing projects ever undertaken by an American university. The Phonograph - On December 7, 1877 Thomas Edison demonstrated his phonograph at the New York City offices of the nation's leading technical weekly publication, Scientific American. The following report set off a stampede of reporters to Edison's laboratory to hear the amazing device. Edison National Historic Site - Where Modern America Was Invented - Thomas Edison’s home and laboratory are a step back in time, when machines were run by belts and pulleys and music was played on phonographs. Where to the passerby, the buildings betray little evidence of the industries they once started. Discover where America’s greatest inventor changed our world forever. This resource contains educational activities about energy concepts, the power of the sun, energy conservation, energy transformation, electricity and fossil fuels being presented by famous gothic horror characters. Electrical Safety - Static Electricity - Fruity Electricity. Flying a kite near any kind of overhead wires is VERY DANGEROUS! The overhead wires could shock the kite, the electricity would then travel down the kite's string and shock you! Only electrical plugs should be put into electrical outlets. Never place anything else into an electrical socket, it may shock you or start a fire! Lamps use electricity to make light and can get very hot! If things get to close to a hot lamp they can catch on fire! Hair dryers and water don't mix, and can be very dangerous! Never use a hair dryer near water and never place a hair dryer in water. This is R-Y-B three phase 40A 440V AC Solid State Relay with 3-30 V DC Control Signal. It has Built in HeatSink and Fan. It is good for Controlling a Bank of heaters. This model could go upto 120A with SSR's in parallel for Proportional Control. it is unwise to use an SSR, a Electromechanical Contacter will perform better. The merit of SSR is fast switching, no wear and tear. No dust humidity influence. This was a Custom Built Product for Converting a 10-100 V Signal from a Motor Tacho to pulses, to indicate the distance moved by Conveyor belt with Job Material. The Digital Indicator would indicate the speed and the Mechanical Counter would Log Quantity of Materials Moved. The voltage was first brought down to low levels with an attenuator and zener protection. A VCO and a monostable created a train of pulses. These pulses drive a darlington transistor pair which operates the Electromechanical Counter that has a Solenoid. 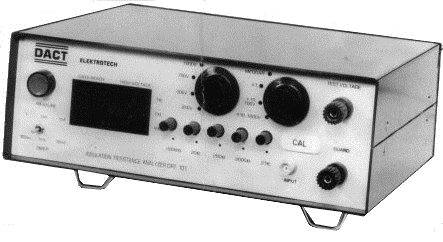 The voltage is also scaled, calibrated and displayed on a Digital Voltmeter. The circuits are partially shown here, two versions. In this the VCO chip is 8038, it is hard to procure, but it is an excellent chip. This is using opamps, hard to configure and build, but a proven design. The VCO can also be built by a Microcontroller chip which has an analog input. Any I/O port can be the Oscillator output. This is easily possible as this system is within the 1 MHz range. 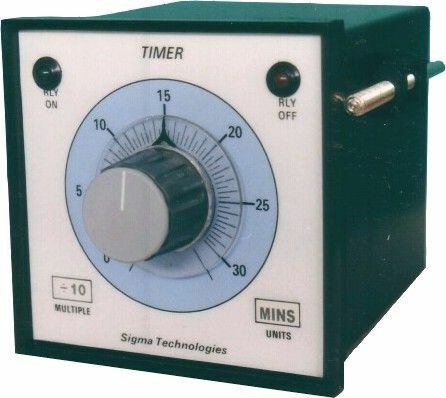 Here is is Digital Timer Learning Gadget. The buttons make a sound and Light up internal LED lamps. Power On-Off control, Digital Timer; Start, Reset Scroll and Select are the controls. This will simulate the operation of a microcontroller based digital timer. Set by pressing select to get a marker over orange digit, Use Scroll to set number. Press Start to start timer, Start to be off to set again. The buzzer will turn on when Time elapsed matches time set. and the alarm relay trips. And a Flashing Annunciator signals end of process. Now Reset will start process again and stop flashing LED. Gates can be combined to make combinational or sequential logic circuits. combinational circuits are a complex network of gates interconnected to evaluate a pattern of output for patterns of input. Sequential circuits use memory elements hence output patterns depend both on input patterns and the memory of history of events. An example of combinational logic circuit is a seven segment display decoder CD4511 and and example for a sequential logic circuit is CD4029 up-down counter. When a customer finds a Tera Ohm Meter expensive, Suggest a low cost scaled-down model to suit his need. These types are useful for people sub-contracting Telecom Equipment Manufacturing. Even if we have Developed a High Precision System we cannot sell it in a Market that needs an Affordable Instrument with lower Specs. Three Types of the same Product for Three levels of Affordability and Field of Application. Get the idea? This probably went upto 500V and 100V with a Toggle Switch and measured upto 1 Giga Ohm or 1000 Mega Ohms. The test voltage would be applied on the Switch, Connector or Magnetics to measure the leakage current in its insulation. The leakage current would be converted to voltage, clamped with diodes and fed to the Vref of a 7107 which displayed the Insulation Resistance by doing a 1/x. Normally we use Vin to measure the voltage, in this instrument the Vin holds the Reference. This was a Heater which was custom built for a CRT manufacturer, It is comprised of many Tubular finned heaters. And probably a big fan that worked at high temperatures. This was used in a Heating Chamber which aged or tested CRT monitors. It had a temperature controller, a remote indicator. 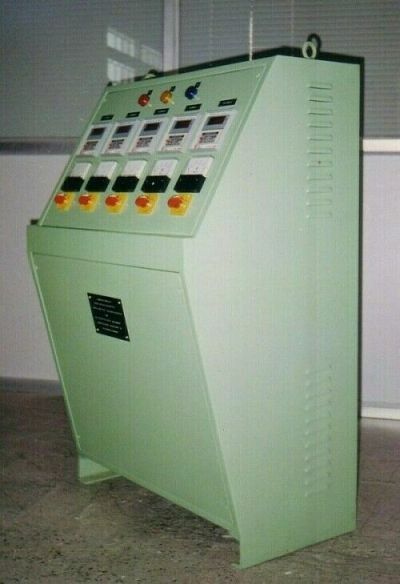 This is a Multi Zone Temperature Control panel used in Plastic Extrusion Moulding. We made many of these and it helped us learn cable management techniques. The panel is a standard way it was built and some of the merits were the selection of panel components and wiring expertise. This could take current or voltage inputs from many remote transmitters, 4-20mA or 0-1 V Inputs. Then it would display the calibrated value in a LED display. The Zone number was a digital display. This serves as a monitor of process values. It had a analog output with a digital channel byte-word output for interface with other instruments. This uses the CD4051-52 for the analog switching. Operating this at +/- 7.5V gives best isolation from channels and low ON resistance. Now you have many types of devices to do this. When a large area or object has to be heated, many heaters are used. This device can monitor and display the temperature at various points. The Operator then can make adjustments in heating or cooling so that he can maintain Uniform temperature or a Temperature Gradient as specified by the Process. 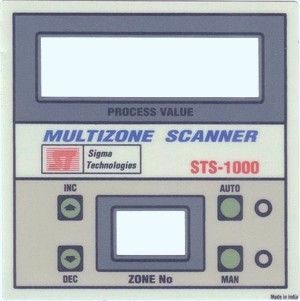 There are many ways, these scanners are used. Many different parameters like pressure, temperature, level are measured with different sensors and converted to a 4-20 mA level using transmitters for each sensor. Then many parameters can be measured in one equipment, when it needs only periodic attention. As the scan rate can be set from 1 to 50 seconds, the operator will be able to keep a tab on the values or record it. This reduces the real estate required on the control panel. Then the control room can be small, as it has to be at a vantage point, with a birds view of the entire factory floor. This was built in a 96 X 96 Cabinet. 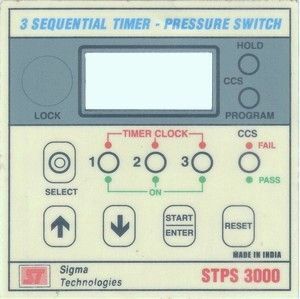 It takes the process thru three timer delays and the pressure is measured after a certain stage and at a setpoint the process, job or DUT passes or Fails. It could be stress, strain or load testing on object. Synchronous switching of multiple electrical devices - An electronic timer consisting of CMOS integrated circuits is described that synchronously switches multiple electrical devices on and off.. This is the safe enclosure for the Encapsulated Mini RTD PT100 Transmitter and was first made for the Electronic Relay with no moving parts, The Solid State Relays - SSR. Potted, Encapsulated in epoxy, hermetically sealed. It has a Nickel Plated Aluminum Plate insert molded. For removing heat from BTA41600. The plastic is a fire retardant high temperature grade. The epoxy is ciba araldite, fine alumina is filler. A transparent terminal cover for safety. The BTA41600 from Thomson-CSF Semiconductor (STMicro) was Excellent for this application. The Metal tab of the device was Insulated from the Silicon inside the device. This device along with MOC3041 (motorola) made a great pair for IO control. Both devices may have had isolation in excess of 2000 V DC, if i remember right. In case you have other Thyristors that do need insulation use Mica for Robust Applications, Silpads for moderate heat, PolySulfone Isolators for low heat. Alumina Blocks for High Heat and Excellent Isolation. The best being thin Alumina Slabs. UC Riverside, Serial Communication ESD lab. 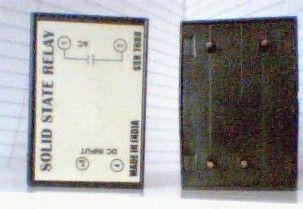 Serial MIDI Interface 80C51/80C31 Version. Microcontrollers are versatile for process control instrumentation, The Instruments need to be small and power efficient, they have to be immune to electrically noisy environments. When such a instrument is mounted closed to big machines, it has to be resistant to vibration failure due to harmonics. When it is used in ships or chemical industries, they need to be corrosion resistant. This makes Industrial Instruments a challenge to design, as the reliability is next only to Medical and Military instrumentation. In applications like data loggers, scanners and PID Controllers Microcontrollers are inevitable. The analog and digital counterparts that were built years back were difficult to maintain and very big in size. With a uC a 48*48 1/16 - DIN PID Box is possible, as shown here Newport Autotune PID. Modular Automation like PLC uses many uCs. There are Multiplexers, Analog and digital modules controlled by uC. Modern Computer based SCADA have wireless interfaces and transmitters using uC based intelligent circuits. 8052.com - Community, Code, How-To. Build your own uC Projects SBC, Projects.